In 2009, the Austin Code Department was a small division of the Solid Waste Services Department. Austin Code now has over 100 employees, and is a standalone department with an important responsibility to the community we serve. Austin Code believes in collaboration, education and partnership between the department and the community. Get to know your neighborhood Code Inspector in each of the districts they are assigned. The Austin Code Department maintains the balance between code compliance and code enforcement by identifying dangerous and substandard conditions and implementing programs to ensure a minimum standard is met. 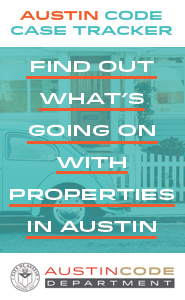 The mission of the Austin Code Department is to provide effective community education and fair and equitable enforcement of local property maintenance, land use and nuisance codes in order to gain and maintain compliance, so that Austin will be safe and livable. Building a Greater Austin together through Code Education, Collaboration and Enforcement. Report a code violation by calling 3-1-1 or by submitting a report online. Request a Code Inspector for your meeting or community event online at least one week prior to the event. For all other inquiries, please call 3-1-1. Click Here to view the 2017 Annual Report (PDF).